Intuition in the kitchen is a good thing. It helps you know when to pull something out of the oven, when to stop salting, when to go out on a limb and throw in a random ingredient that brings a dish from ordinary to proposition-inducing. Part of the joy in developing one's kitchen (and bedroom) intuition is the adventure experimentation brings. With practice, there comes a culinary confidence that opens up a whole new world of possibilities when approaching a recipe. This week's recipe came from that intuitive place - drawing upon inspiration from my garden, a ballerina, and my fondness for putting whipped cream on everything. When I was in NYC recently, you may remember I made a pavlova for my friends M. & T. that merited closer attention in a post of its own. Since I always love to deliver: here's what happens when something that was already delicious gets invited into my Kitchen Boudoir. A pavlova (named for the famous ballerina Anna Pavlova) is a baked meringue dessert originating from Australia or New Zealand (depending on whom you ask) that is typically topped with pudding or whipped cream and fresh fruit - usually a combination of strawberries and kiwi. Perhaps it was the muted spring morning light, but the thought of a heavier pudding and the bright fruit did not feel right. My kitchen intuition wanted something lighter, more sensual, and better suited to the season. Enter rhubarb, that slender spring stalk: sweetened with vanilla sugar and cooked down into a compote with orange zest, folded into freshly whipped cream and Balkan-style yogurt. This creamy concoction is a dessert affectionately known as a 'fool,' however, serving it with meringue could also classify it as a British dessert called an Eton Mess. No matter what its name, this dish is an inspired combination. It's light and fresh and cheekily flirts with your sweet tooth. Making meringue is a magical process. I love how the whites transform from their liquid state into a whipped white topping: sticky-sweet - made to be licked off beaters and spoons. For a successful meringue, room temperature egg whites are the key. The whites are whipped with vanilla and cream of tartar until soft peaks form. At this point, vanilla sugar is slowly added, and the mixture is whipped until stiff and glossy. Using a spatula (or the back of a spoon), the meringue is shaped into nests, approximately 3 1/2 - 4" in diameter. For a more uniform look, the meringue can also be piped using a pastry bag, or a ziploc bag with the tip cut off, but I prefer a rustic look for this dish. The recipe makes 6 nests. I used what was left over to make little clouds of meringue to use as toppers. The meringue is baked in a 300 F oven for 35 minutes or so. The tops are lightly golden, with a crack or two exposing the chewy marshmallow underneath. Take note that if making them in advance, the meringues must be left to dry completely in the oven (which has been turned off) before storing them in a container with a lid, otherwise the surface will crack and the nests will easily break. The first rhubarb of the season, is a beautiful shade of pink, which I much prefer to the louder greens-and-reds of a pavlova's kiwifruit-and-strawberry. I have some rhubarb growing in my garden, and happily added a few stalks to the ones I bought from my local greengrocer. 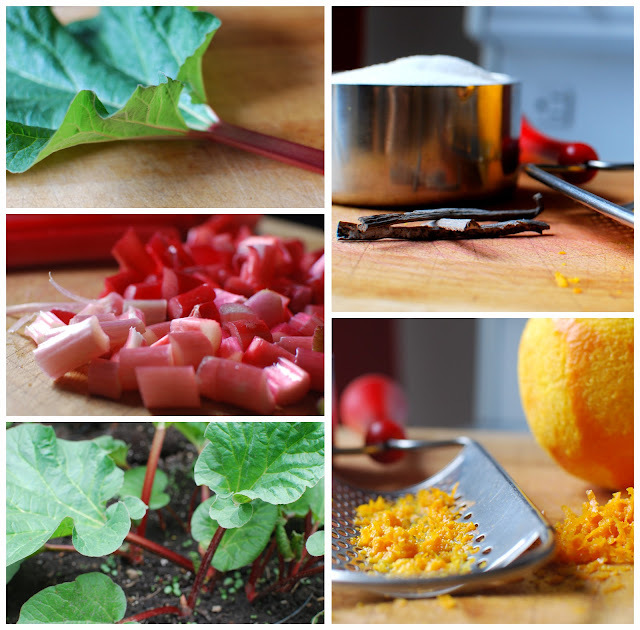 The rhubarb is cooked down into a compote whose flavour is complemented with orange zest - rhubarb and orange having enjoyed success in many a dessert after being paired together by some long-ago culinary matchmaker. Vanilla sugar is added for sweetness and to balance out the sourness of the rhubarb and the bitterness of the orange. Once cooked down, the compote is strained and any remaining liquid is further boiled down into a beautiful red syrup. To prepare the fool, the cream is whipped until soft and billowy, and Balkan-style yogurt is mixed in. The rhubarb compote is then carefully folded into the cream, streaking it with the fruit. The syrup reduction is then drizzled across the rhubarb-rippled cream, colouring it further. I discovered that the origin of "fool" as a dessert term is from the old French verb "fouler," which means to crush (in this case it's fruit that's being crushed). 'Fouler,' to my delight, also means to 'act wickedly,' which I definitely did in my treatment of this dessert. I lavishly dolloped the creamy fruit-strewn fool atop a nest of marshmallowy meringue and garnished it with a supreme of oranges, a meringue cloud, and a sprig of garden-fresh mint. Once you have a spoonful, it is easy to think of other ways to apply the latter definition while enjoying this dessert. Enjoy! This dessert tastes like opening the window on a warm spring day feels - light, fresh, sweet, and completely satisfying. In a bowl, add egg whites, vanilla, cream of tartar and salt. Whisk at medium speed until soft peaks form (tips will curl). Add sugar, one tablespoon at a time, whisking on high speed until peaks are stiff, the sugar has mostly dissolved, and the meringue is glossy (about 7 minutes). Prepare two baking sheets with parchment paper. Using the back of a spoon or spatula (or pastry bag for a more uniform look), shape meringue into nests, approximately 3 1/2-4" in diameter and 1 1/2 inches thick. Use any leftover meringue and shape into small mounds, approximately 2" across, to use as toppers. Bake in a 300 degree oven for 35 minutes, or until tops are a light gold in colour. Turn oven off and let nests dry in oven completely. If making ahead of time (meringue will keep in a container with a lid for a few days), ensure they are fully dry, otherwise they will crack, soften, and break. In a medium-sized heavy-bottomed pot, combine all the above ingredients, cover with lid, and bring to a boil on medium-high heat. Reduce heat to low and let simmer and cook down (about 25 minutes), stirring occasionally to avoid burning the sugary fruit. Remove from heat and strain, reserving the liquid. Boil remaining liquid and reduce by half to a syrupy consistency. Set aside compote and syrup to cool completely, but do not place syrup in fridge, as it will crystallize. Whip cream with sugar and vanilla until soft peaks form. Whisk in yogurt. To make the fool, carefully fold the rhubarb compote into the whipped cream, so that the fruit is rippled throughout and some areas are still white with cream. Drizzle a small amount (2 tablespoons) of the rhubarb syrup onto the mixture and carefully fold in, creating another ripple of colour. Generously dollop the fool on top of each individual nest of meringue. Garnish with supremed oranges, a meringue cloud, and a sprig of fresh mint. Wow this looks gorgeous and so summery! This post is making me want to make a pavlova for the weekend! Decadent was the first word that popped into my head, but someone beat me to it already. You have a fantastic intuition my friend because this sounds like a really sensuous dessert! Amazing. You got me very inspired with this recipe. I managed to bring down the sugar a bit. (unfortunetly, meringue is not meringue without sugar, but the fool turned out amazing! SO happy you felt inspired! What is your approach to lessening the sugar in recipes? Do you do it intuitively, or is there a specific ratio or rule you follow?